Jan Arkless's bestselling recipe book has given confidence to a whole generation of new cooks. This new edition has been fully updated to include such new recipes as Hoisin Chicken Stir Fry, Tabbouleh and Winter Pork Casserole. Leaving home for university or to start a new job? Suddenly faced with cooking for yourself for the first time and don't want to exist on a diet of takeaways or squander your money on expensive ready-made meals? Don't worry! 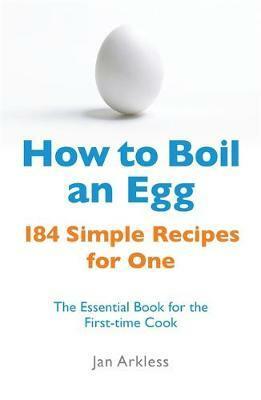 All the recipes you need are here, starting right at the beginning with how to boil an egg - and then how to poach, scramble and fry it as well! The essential guide for those new to cooking. Includes useful table of quantities when cooking for one. Simple instructions on how to prepare vegetables. Easy, tasty and economical meals. Most of the recipes serve one - but some feed two or more for when you're entertaining friends. How to Boil an Egg explains all the things that other cookery books assume you know. Jan Arkless is a qualified teacher of Home Economics who taught in Secondary and Special schools. Jan began writing as a career and pastime which could be indulged in whenever time was available. Jan soon decided that she preferred writing to teaching, and has since written several successful Right Way titles on cookery and weddings. Jan lives in Oxford, England, with her husband, Bill, and has four grown up children.